Battle Royal is a game that revolves around the cunning plots of the Medieval Tudur Family. King Louis the VIII and his six petulant wives will have gamblers spinning and reeling their way to big Bitcoin wins. That is if they survive the guillotine!! I always wondered what it was like to be embroiled in the debauchery of King Henry VIII’s life! The gluttony of food and wine, wanton maidens throwing their wares before the king. Not such a happy situation for his harem of wives. There must have been a quiver of exhilaration crossed with fear when that proposal was made. Who knows where you would end up in a tower, headless, or in the bed of a disease-ridden geriatric! Battle Royal has the tables turning with the six wives into a formidable force to overturn the powers of their, win his heart or lose their heads. A brilliantly animated game with awesome features ensures a blast of bitcoin wins. 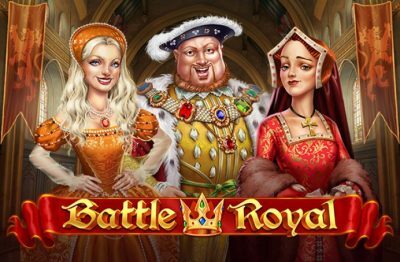 Battle Royal is a fully mobile optimized game that can be played on any tech device to have even the most royal of Tudor heads to roll. The 5 reels are adorned with the beautiful Tudor women who live every day online. With them are their jewels in the form of card symbols, but alas no jewels can keep you safe from harm. On 20 pay lines, these beautiful queens can connive a plan to garner great wins without King Louis knowing anything of their plot. While listening to the music typical of the medieval royal court, Louis himself is the Wild card and unlike with his many wives, will be of great assistance in creating winning combinations. The Battle Royal coat of arms is the Scatter symbol. Land a Scatter on reels 1 and 5 for a chance to trigger either Free Spin mode or the Long Live the King feature. Heads are rolling left right and center at the hand of the treacherous king. Should the guillotine fall and one of the queens appear on the reel, she will be beheaded and sent to her death but not before going wild for the entire round and when the last wife remains the round will end. The Crafty wife who managed to survive the axing will lead gamblers to greater Bitcoin prizes. Her fate, however, is in the hands of the gambler who may swop loyalty to protect the king to trigger the Long Live the King Feature. For those of you who have found some sympathy for the beleaguered King, this is your opportunity to help him escape the tyranny of his ex-wives and make some extra wealth along the way. This feature is a game of selection. The king is locked up in a dungeon. By choosing a chest of treasure you can win a host of different multipliers and finding the key will offer an instant escape from the dungeon. Players can take the instant escape or stay and play for more wins. Should a player stay, they do so at their own peril, but it could prove to be profitable. King Louis and his bevy of scheming wives create a playing field that is filled with intrigue and drama. Who will be beheaded first and who will survive another day? 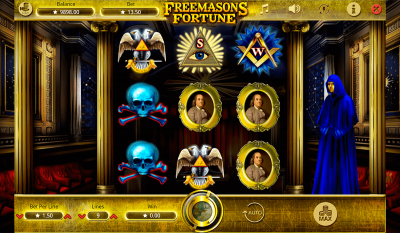 The shenanigans of the Tudor court come to life on an excellently animated slot by Play’nGo that offers a varied amount of features to earn big Bitcoin treasures. This medieval era has long held much fascination both on the battlefield and in the royal court. This game to will hold the fascination of players experienced and novice. With the potential of winning x5000 of a maximum bet, any gambler will be keen to set the King free.